I am very excited to put Alain Gomis on my “Directors To Watch For” list. Tey, which he also wrote, is his third feature film and sixth film. Satché knows that he will die at the end of the day. A patiently-shot and moving opening sequence with his family and his close friends sets up the film’s premise. His family and close friends encircle him in a ritual of farewell, a formality for his impending death. There is sorrow and pride – but not surprise – for his burden. Death is as inevitable as life. The film then chronicles that last day of his life. What struck me as particularly realistic is that Satché does not try to find the meaning of life in one day in an attempt to make the end more palatable, more meaningful. Over the course of the day, we come to realize the essential absurdity of life. To attempt to tie loose ends with childhood friends, old lovers, family, friends, wife – he discovers that all this is futile. As his Uncle Thierno notes, we don’t finish anything, we simply stop. Satché is fortunate to know when his time will be over, so that he can simply pay attention. Mr. Gomis’ subtle direction gently steers us toward acceptance and a kind of spiritual reassurance. He has a lovely way of juxtaposing shots and vignettes of such beauty, humor and joy. Critics have praised him for a certain “lyrical” style; I find him realistic and unflinching in his point of view. Forgive the cliché, but I found this film Fellini-esque in its refusal to differentiate between past, present and future and between what’s in front and what’s in the periphery. Tey (Aujourd’hui). Dir. by Alain Gomis. Granit Films, 2012. In Senegalese and French. 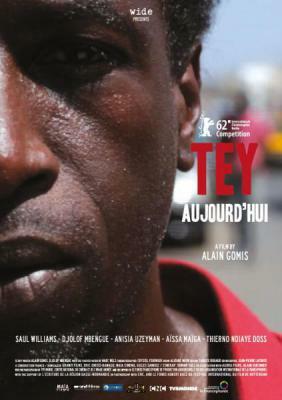 Tey was an official selection at the Berlin Film Festival 2012.